I must admit when I started The Saucepot’s Lunchbox, I didn’t quite realise just how much of a challenge it would be to keep the lunch boxes varied. It started out with a lot of fish and seafood and I often use similar salady ingredients, but I think this week’s is one of my most interesting yet and I was really looking forward to munching on it all morning. 1. 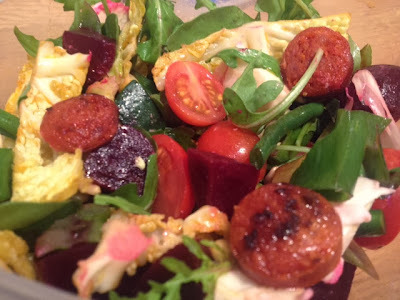 Gently fry the chorizo, cabbage, courgette and green beans until cooked. 3. When cooled mix together with the cold ingredients and fill up your lunchbox.